Manipulator is a plant growth regulator for use on wheat. This product is approved for use in Canada and the European Union, but not in the USA. The U.S. Environmental Protection Agency’s maximum residue limit for the product is zero. 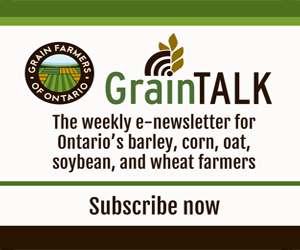 Most major Ontario grain elevators and millers will not accept wheat treated with Manipulator. Industry representatives are in conversation with the registrant to develop the best strategy moving forward. January 2016 dawned with a continued bearish tone in the grain complex. The January 12 United States Department of Agriculture (USDA) report will surely set the early winter trend for the market. In the December USDA report, corn ethanol use was raised by 25 million bushels, but exports were cut by 50 million bushels. The USDA did not touch the balance sheets for soybeans and wheat. In Brazil, parts of the state of Mato Grosso has been dry. The USDA has lowered Brazilian soybean production from 100 MMT to 98 MMT.